If you have been wanting to improve your rigging inspection skills this program is the most comprehensive in the industry. We start with a wide assortment of slings and rigging gear with varying degrees of damage and deficiencies that allows participants to learn inspection hands-on. 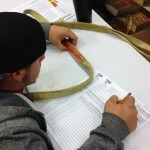 Rigging Inspector training provides technical and hands-on training in an environment unique in the material handling field you will learn the principles and standards specific to the rigging gear and sling inspection. This program has a compliance basis under OSHA, ASME & API industry standards and specific to state and government agency requirements where applicable. An excellent program for inspectors and those who maintain rigging equipment for any company.